I never write about my students. But, these days my heart seems to be filled by them. Over the last 13 years I have traveled from Boston to Denver to Albuquerque to Santa Fe. Then to back to Albuquerque. Then to Brooklyn, and now I am in Seattle. Living in each city, I have met hundreds of students over the years and have seen a lot of healing and transformation unfold before my eyes. It is a great joy to see such things. It is the reward of the blood, sweat and tears of my life – to see human beings becoming brighter. These days, I am feeling so grateful for all of my precious students. This month in particular seemed to be a kind of harvest of the love I have given to so many students over the years, coming back to me in the form of small gifts. I received lots of gifts in August! Cd’s, bracelets, youtube video clips and songs, flowers, all kinds of vegetables and herbs from the garden ~ even money! And perhaps the most precious gifts of all were small texts and notes to let me know me how my students are growing and evolving in their lives from the work we have done together. 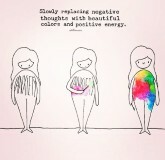 The caption reads “Slowly replacing negative thoughts with beautiful colors and positive energy”, and the woman is washing away her anxiety with beautiful colors. I feel my heart light up when I think of my students practicing diligently with their minds and bodies, making healthier and more positive choices and changes in their lives. Last weekend during the Finding True Self workshop, I witnessed eight people tearing down the walls within them to awaken their Souls. It was beautiful to participate in it with them. I had a global feeling – I thought “Yes, the walls of this world must come down. This is the work that we are doing right here, inside of ourselves”. This world will change as each and every one of us changes. That’s how important our light is. So, my students who I have had the honor to meet and work with for the last 13 years, I am so thankful to you. You have taught me so much. I have grown because of you. I love you very much and I believe in your pure Souls. This is something that I am actively working on these days. When I really stop to think about this, I suddenly feel very alert. What is it that I’m planting? Right now. And this moment. And this one. Each moment suddenly becomes so important. Where is my mind? Am I planting flowers or am I planting weeds? I feel that my current reality is completely a creation and manifestation of all my past thought patterns. Not even just thoughts, but stories, unconscious and conscious beliefs, choices. This is why choosing hope is so important for my tomorrow. When I observe myself, I become even more hopeful because I feel that the power is completely in my hands. If there is a change I want to make, I just need to begin with making a healthier choice at this moment. There is nothing and no one but myself who can stop me from doing that. This is both empowering and liberating. But quite frankly, I tell myself a lot of bad news in a day! The behavior is so ingrained. I feel like I have had an unhealthy thinking and talking habit since I was very young. Not only from my own habits rising up within me, but bad news is bombarding us from people and society all day long. Information is everywhere. But what is the quality of this information that we hear whether we want to or not – when we walk into a store, when we answer the phone, when we hop on the internet? Is it healthy food for our brains or is it junk food? This is why it takes constant practice and awareness. I have decided to practice more diligently these days! Another big inspiration for me is Louise Hay and her affirmation work. If you’re not familiar with her, at the very least it will be worth it for you to check out her movie “You Can Heal Your Life”. She drives this message home so beautifully. I talk often about choices and the power of choice. Just choose. For choice’s sake. Because who knows what can possibly happen when we keep trying? In this universe of infinite possibilities, anything could happen. That is what I like best about all those epic movies about revolution and saving the world….the heroes always keep choosing hope, to the very last moment. Recently I realized that I have not been living my life this way. I thought that I was practicing conscious choice all of the time, but suddenly I realized that there is this other me – a small version of myself who is deeply entrenched in her story – who subconsciously chooses negativity and despair whenever she fails A) Failure or B) Abandonment. I found those to be 2 strong triggers for me that send me catapulting miles away from my center, and suddenly I’m controlled again by a habitual response. But by doing this, I can never create a different future. I realized that the key is in choosing hope, no matter how the reality may look. Just choose hope in any situation. Of course, we have to face our situations honestly and look at ourselves clearly and once we have done that work, then we can exercise our power to choose hope. It requires a good deal of self-trust. And as we keep doing so, we change our destiny. We will have a new future that is not just the same old broken record of the past. So, choose hope for what? Hope for a new possibility. Hope for the possibility I dream of. We are, after all, creators of our lives. So I took an honest look at where I have been creating misfortune. I didn’t want to be doing that, but I was, because I was reacting to the moment negatively. This just brings more negativity. The universe is a loyal, diligent and fair servant to our requests. For me, my blog is kind of like a cozy place where I hope you can come and sit down and chat with me. There are many things in my heart that I like to share about and reflect on. I’m so grateful for those of you who share and reflect back with me. I invite anyone stopping by to do the same! Recently, I have been lucky to meet someone who is helping me to make some new adjustments and upgrades on it. One of them is that we added a Services page. I just want to explain about this a little more. In my work, I teach principles and practices to help people everyday. I explore ways in which the mind can come to the body so that we can come to know more about ourselves and heal ourselves on deeper and deeper levels. I utilize principles of Brain Education as well as messages and exercises from the Solar Body book. I often deliver many principles which my teacher, Ilchi Lee, has delivered to me through various books and trainings for the last 15 years. I see people transform everyday, and it is a great joy for me. When I began this blog and was featured on CBS Sunday Morning & People Magazine etc, many people started contacting me here, on Facebook and via email, from all over the country and world. Many of them had questions for me and sought advice. I began to feel that I wanted to help everyone more deeply, not just at a surface level. Of course, this is a choice that each person makes on their own. But, I believe in the beauty and great peace and freedom that awaits us when we go deep inside and meet with our Essence. That’s why I decided to try to offer some of the services that I teach here at my center, online. We did a 5 week Solar Body class which I might offer again in the future and through that again I could see how much benefit people get through simply taking time to feel themselves and meet with themselves – all parts of themselves. So for now, I am offering online private sessions with me at the same price that I do this work in my center, here in Seattle. I am trying to keep it fair for my students here 🙂 In the future, I may offer more classes, as I said, and workshops as well if I find there is an interest and a need. I truly want to see a better world and I believe it starts with me. And you. It’s a responsibility for each of us as human beings to look inward, find our peace, clean off some of our painful layers and shine our light even brighter. It’s our responsibility for a better me, a better life and a better Earth. So, it is with my happiness that I offer these sessions. I would love to meet any of you if you have needs – especially in the areas of adoption, emotional management, mind/body cultivation, spirituality, meeting your inner self, improving your life through self-healing. I just wanted to take a moment to share about this more thoroughly. Please feel free to ask any questions or be in touch if you have further interests!